Updated 2:50 pm ET Republican presidential nominee Mitt Romney on Wednesday condemned a statement made by the American embassy in Cairo that criticized a video made by an Israeli-American that portrayed the prophet Muhammad in a disparaging way and may have sparked mob attacks on the consulate in Benghazi, Libya, as well as on the Cairo embassy. The Libya attack killed four Americans including Chris Stevens, U.S. ambassador to the North African nation. The GOP candidate said President Barack Obama was responsible for the Cairo embassy statement -- even though White House officials had on Tuesday night disavowed it. 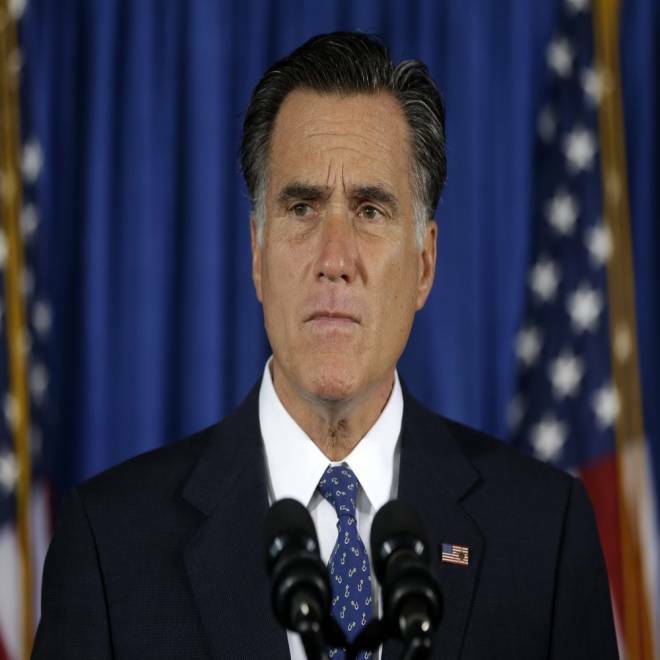 Mitt Romney is standing by his original statement regarding the events in Libya and Egypt as reporters piled on questions about the timing of his comments. Former Ambassador Richard Williamson discusses. But NBC’s Andrea Mitchell reported that the Cairo embassy statement was issued six hours before the mob attacked the embassy. She pressed Romney foreign policy advisor Ambassador Richard Williamson to explain why Romney had criticized a statement made before the mob assault. Williamson said the White House was trying to distract from the substance of the issue by focusing on the timing of the Cairo statement. “The fact is the substance of what the governor said last night was true -- he continues to stand by it,” Williamson told Mitchell on MSNBC. House Intelligence Committee chairman Rep. Mike Rogers, R-Mich., told Mitchell that the Benghazi attack was “a well-armed, well-coordinated event” and not mere spontaneous mob violence. The attacks on the U.S. consulate in Benghazi, Libya and in Cairo almost immediately became a campaign issue Tuesday night, ending the hiatus in political action for the anniversary of the Sept. 11 attacks. NBC's Richard Engel reports from outside the U.S. Embassy in Cairo, where Egyptians have lowered the level of their protests against a controversial anti-Islam movie made by an Israeli-American filmmaker. However, there may be nationwide protests on Friday called by the ruling Muslim Brotherhood party. Romney’s criticism of the “Obama Administration's first response” was a reference to the following statement issued by the American embassy in Cairo: “The Embassy of the United States in Cairo condemns the continuing efforts by misguided individuals to hurt the religious feelings of Muslims -- as we condemn efforts to offend believers of all religions. Today, the 11th anniversary of the September 11, 2001 terrorist attacks on the United States, Americans are honoring our patriots and those who serve our nation as the fitting response to the enemies of democracy. Respect for religious beliefs is a cornerstone of American democracy. We firmly reject the actions by those who abuse the universal right of free speech to hurt the religious beliefs of others." Republican presidential candidate, former Massachusetts Gov. Mitt Romney makes comments on the killing of U.S. embassy officials in Benghazi, Libya, while speaking in Jacksonville, Fla., Wednesday, Sept. 12, 2012. Obama said the United States “rejects all efforts to denigrate the religious beliefs of others -- but there is absolutely no justification for this type of senseless violence. None.” He said many Libyans had joined the United States in condemning the attack in Benghazi. The president made no reference to Romney’s statements in his brief remarks. Former Sen. Blanche Lincoln and former Sen. John Sununu talk about the political reaction to the attack in Libya that killed the U.S. Ambassador Stevens. Later in an impromptu remark, Romney also commented on the brewing controversy over whether Obama refused to schedule a meeting with Israeli Prime Minister Benjamin Netanyahu during a United Nations gathering. NBC’s Mitchell reported that Israeli officials had suggested Tuesday that the White House was snubbing Netanyahu by not scheduling a meeting in late September.